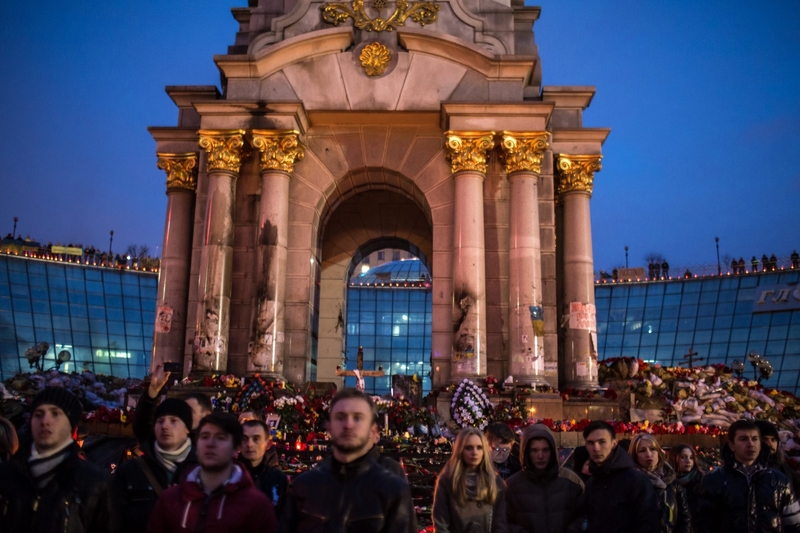 People gather to pray and to listen to speakers Sunday in Independence Square in Kiev, Ukraine. MOSCOW – The sudden collapse of the Kremlin-backed government in Ukraine has for now delivered a profound setback to President Vladimir Putin’s strategy to deepen political and economic ties with the country and thus keep it from embracing Europe. Even as Russia celebrates the closing of Olympic Games that defied some dire expectations, Putin now faces the task of reasserting Russia’s influence in a country that it considers a fraternal ally, one with deep cultural, social and political connections that bind it to Moscow’s orbit regardless of its new government. Russia still has enormous leverage and close allies in Ukraine, particularly in the east and on the Crimean Peninsula, home of Russia’s Black Sea Fleet and a sizable ethnic Russian population that views with disdain the leaders of the political uprising that toppled President Viktor Yanukovych. That has raised fears that Russia would use the disenchanted populations there as a pretext to intervene to reverse Ukraine’s new trajectory – even militarily, as the Kremlin did in two ethnic enclaves in 2008 in another former Soviet republic, Georgia. The fears have been so palpable – and the subject of endless speculation in Ukraine and here in Russia — that President Obama’s national security adviser, Susan E. Rice, warned in a television interview Sunday that it “would be a grave mistake” for Russia to use force. How exactly Russia will respond remains to be seen, but the turmoil is certain to further its strain relations with Europe and the United States, which officials here have been denounced for meddling in Ukraine at the expense of Russia’s vital interests. At the same time, the United States and Europe have accused Russia of trying to impose its will there. Putin’s envoy refused to sign the agreement mediated Friday by three European foreign ministers to end two days of carnage in the capital, Kiev, only to have the agreement overtaken by a political upheaval that threatens to undercut Russia’s influence over any new government. The Kremlin’s spokesman, Dmitry S. Peskov, complained Sunday that while Yanukovych had honored the terms of the agreement – which called for new elections and a return of constitutional powers to the Parliament – his political opponents had not. Instead, he said, the Parliament has effectively seized power and is now rushing through an emboldened series of votes that has provoked rage among Russian lawmakers and commentators. Putin has not yet made any public statements about the latest events, as is often the case when he is confronted by unexpected challenges or crises. “Let’s wait and see,” Peskov said. Putin and Yanukovych have spoken several times in recent weeks to discuss the situation there, but Peskov said he did not know if they had spoken since Saturday, when Yanukovych’s legitimacy evaporated and he fled Kiev, leaving protesters swarming his opulent presidential compound. It is clear that Putin has followed the crisis intently, even as he publicly attended to the Olympic festivities that he clearly has relished as a symbol of a new Russia. On Friday, he met with his national security advisers and a day later dispatched two Russian lawmakers to a regional party congress in Eastern Ukraine that had been called to rally opposition to the new political authorities in Kiev.